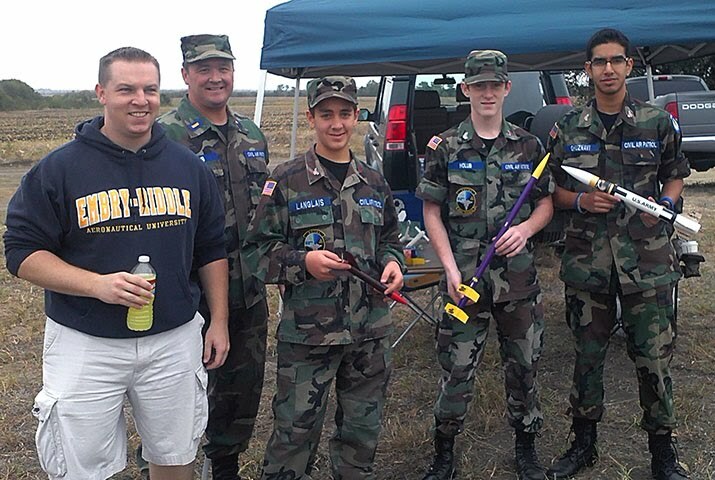 DALLAS- Civil Air Patrol cadets continued their Aerospace Education Saturday Sept 21 as they completed the firing of home built rockets at a local firing range. Before firing their home built rockets the cadets studied the history of rocketry beginning with ancient Chinese experiments and up to today’s largest NASA rockets. Classes were taught by lst Lt Jared Deisinger, deputy commander for cadets and 2nd Lt Winston Cutshall, Aerospace Education Officer for the 391st Composite Squadron Dallas. Each participating cadet will receive the CAP Badge for Rocketry which they can wear proudly on their dress uniform. The badges will be awarded to the cadets at the monthly squadron promotion and awards ceremonies later in the month. Civil Air Patrol, the official auxiliary of the U.S. Air Force, is a nonprofit organization with more than 61,000 members nationwide, operating a fleet of 550 aircraft. CAP, in its Air Force Auxiliary role, performs 90 percent of all continental U.S. inland search and rescue missions as tasked by the Air Force Rescue Coordination Center and was credited by the AFRCC with saving 54 lives in fiscal year 2011. Its’ volunteers also perform Homeland Security, disaster relief and drug interdiction missions at the request of federal, state and local agencies to nearly 27,000 young people currently participating in the CAP cadet programs. CAP received the World Peace Prize in 2011 and has been performing missions for America for 70 years. Congress has nominated the service to receive the Congressional Medal in recognition of its’ wartime service. CAP also participated in Wreathes across American, an initiative to remember, honor and teach about the sacrifices of U. S. Military veterans. Visit www.gociviliaairpatrol.com or www.capvolunteernow.com for more information.